Let's start with the idea of a chemical reaction. 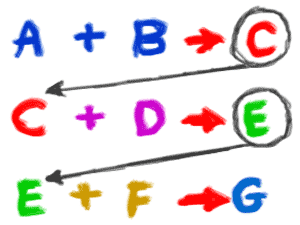 Reactions occur when two or more molecules interact and the molecules change. Bonds between atoms are broken and created to form new molecules. That's it. What molecules are they? How do they interact? What happens? The possibilities are infinite. 1. A chemical change must occur. You start with one molecule and turn it into another. Chemical bonds are made or broken in order to create a new molecule. One example of a chemical reaction is the rusting of a steel garbage can. That rusting happens because the iron (Fe) in the metal combines with oxygen (O2) in the atmosphere. Chemical bonds are created and destroyed to finally make iron oxide (Fe2O3). When a refrigerator or air conditioner cools the air, there is no reaction in the air molecules. The change in temperature is a physical change. When you melt an ice cube, it is a physical change. When you put bleach in the washing machine to clean your clothes, a chemical change breaks up the molecules in your stains. 2. A reaction could include atoms, ions, compounds, or molecules of a single element. You need to remember that a chemical reaction can happen with anything, just as long as a chemical change occurs. 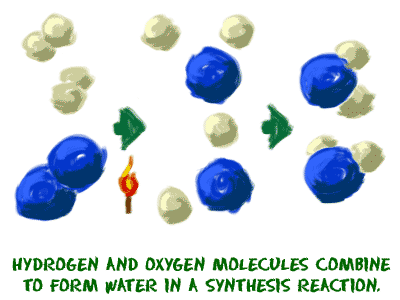 If you put pure hydrogen gas (H2) and pure oxygen gas in a room, they might be involved in a reaction to form water (H2O). However, it will be in very very small amounts. If you were to add a spark, those gases would be involved in a violent chemical reaction that would result in a huge explosion (exothermic). Another chemical reaction might include silver ions (Ag+). If you mix a solution with silver ions with a solution that has chloride (Cl-) ions, silver chloride (AgCl) precipitate will form and drop out of solution. 3. Single reactions often happen as part of a larger series of reactions. When a plant makes sugars, there might be as many as a dozen chemical reactions to get through the Calvin cycle and eventually create (synthesize) glucose (C6H12O6) molecules. The rusting example we used earlier only showed you the original reactants and final products of the chemical reaction. There were several intermediate reactions where chemical bonds were created and destroyed. The silver chloride example only focused on the ions. In reality, the two solutions were created when two salts dissociated (split into ions) in water.